One of the trickiest questions you have to ask yourself before you adopt a dog, is whether or not you’ll be home often enough. If you live alone and work keeps you busy ’til dusk, adopting a dog can be a bit of a situation. This work-life-dog balance puzzles literally every working person, including famous ones. 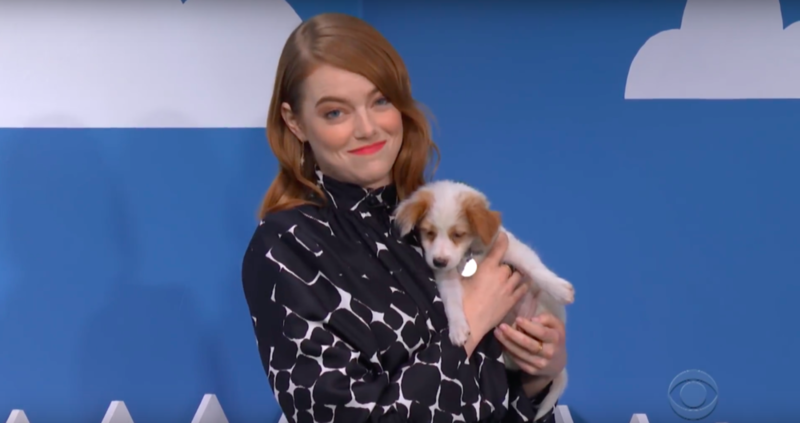 Emma Stone appeared on The Late Show with Stephen Colbert where she did a bit with the host to promote the adoption of shelter pups who were rescued from Hurricane Florence by North Shore Animal League America (NSALA). Stone especially bonded with a shepherd mix puppy named Dwayne “The Dog” Johnson, who slept on her lap during her entire nine-minute interview. Stone called the puppy interview “the greatest thing I’ve ever gotten to do on a show,” but when Colbert suggested that Stone adopt the dog, the Maniac actress lamented that she couldn’t take Dwayne home with her. “I absolutely love dogs. I would love to [adopt him], but I already have a dog,” said Stone, who added that her brother ends up watching her dog most of the time because she’s often traveling for work. In case you were curious, according to BarkandSwagger.com, Stone has a golden retriever named Ren that she adopted in 2012. NSALA is the world’s largest no-kill animal rescue and adoption organization. You can help find homes for the pups seen on The Late Show at their website. We searched the database for little Dwayne and found no results, so it looks like he might have been scooped up by a loving fur-ever family.